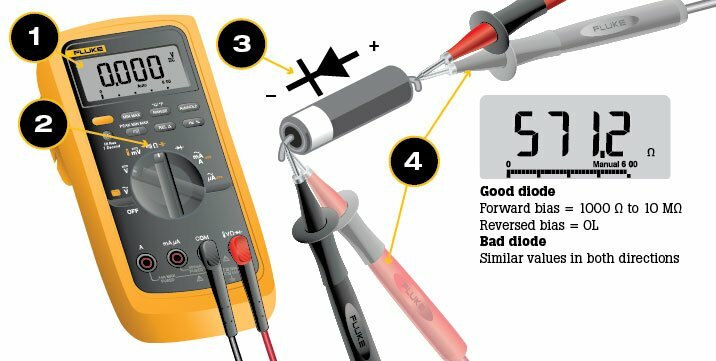 Steps for using a multimeter in the Diode Test mode. Diode Test mode: almost always the best approach. 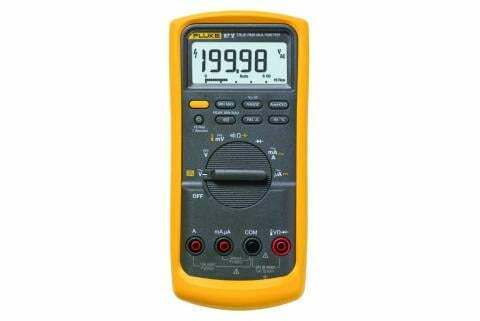 Resistance mode: typically used only if a multimeter is not equipped with a Diode Test mode. Note: In some cases it may be necessary to remove one end of the diode from the circuit in order to test the diode. Does not always indicate whether a diode is good or bad. Should not be taken when a diode is connected in a circuit since it can produce a false reading. CAN be used to verify a diode is bad in a specific application after a Diode Test indicates a diode is bad. A diode is best tested by measuring the voltage drop across the diode when it is forward-biased. A forward-biased diode acts as a closed switch, permitting current to flow. Make certain a) all power to the circuit is OFF and b) no voltage exists at the diode. Voltage may be present in the circuit due to charged capacitors. If so, the capacitors need to be discharged. 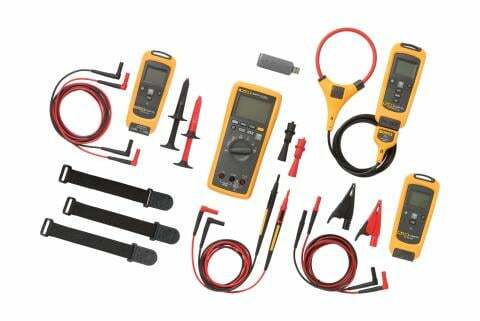 Set the multimeter to measure ac or dc voltage as required. Turn the dial (rotary switch) to Diode Test mode ( ). It may share a space on the dial with another function. Connect the test leads to the diode. Record the measurement displayed. Reverse the test leads. Record the measurement displayed. A good forward-based diode displays a voltage drop ranging from 0.5 to 0.8 volts for the most commonly used silicon diodes. Some germanium diodes have a voltage drop ranging from 0.2 to 0.3 V.
The multimeter displays OL when a good diode is reverse-biased. The OL reading indicates the diode is functioning as an open switch. A bad (opened) diode does not allow current to flow in either direction. A multimeter will display OL in both directions when the diode is opened. A shorted diode has the same voltage drop reading (approximately 0.4 V) in both directions. 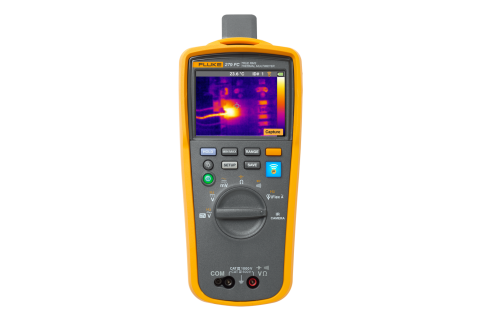 A multimeter set to the Resistance mode (Ω) can be used as an additional diode test or, as mentioned previously, if a multimeter does not include the Diode Test mode. 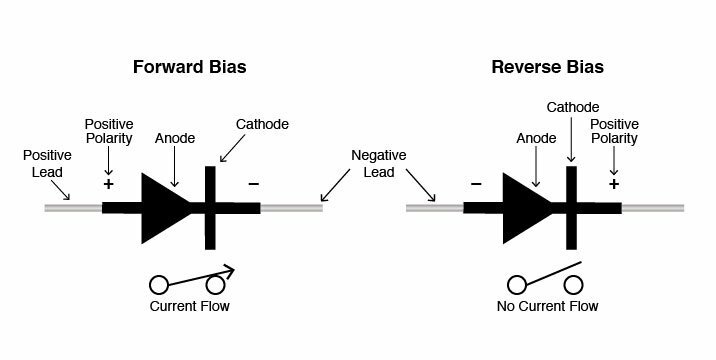 A diode is forward-biased when the positive (red) test lead is on the anode and the negative (black) test lead is on the cathode. The forward-biased resistance of a good diode should range from 1000 Ω to 10 MΩ. The resistance measurement is high when the diode is forward-biased because current from the multimeter flows through the diode, causing the high-resistance measurement required for testing. A diode is reverse-biased when the positive (red) test lead is on the cathode and the negative (black) test lead is on the anode. 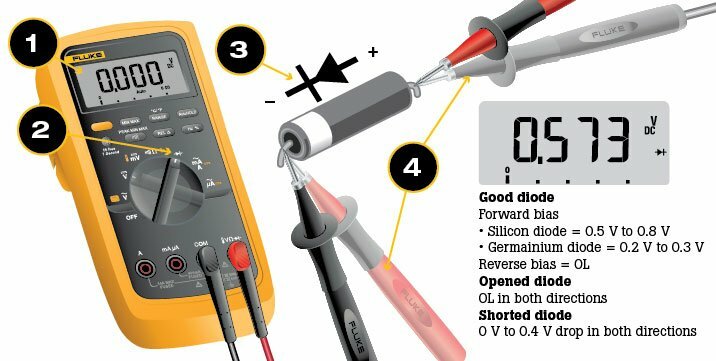 The reverse-biased resistance of a good diode displays OL on a multimeter. The diode is bad if readings are the same in both directions. Turn the dial to Resistance mode (Ω). It may share a space on the dial with another function. Connect the test leads to the diode after it has been removed from the circuit. Record the measurement displayed. For best results when using the Resistance mode to test diodes, compare the readings taken with a known good diode.